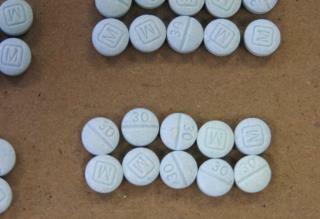 (Newser) – Get ready to hear much more about a powerful new street drug called W-18. Police in Edmonton, Canada, this week announced a huge seizure of it made in December—4 kilograms, or enough for hundreds of millions of pills, reports the Globe and Mail. The drug is a synthetic opiate like fentanyl that produces a heroin-like high, but it's 100 times more powerful than fentanyl and 10,000 times more powerful than morphine. As Vice and the CBC explain, it's probably being churned out by labs in China and then shipped to North America via services such as FedEx. This is the second major W-18 seizure within a year in Canada, but it's not just a Canadian problem. A drug dealer in Florida convicted of importing fentanyl also had 2.5 pounds of W-18, the Sun Sentinel reported in March. But because the drug isn't illegal—yet—it didn't factor into his sentence. No wonder all those Canadian posters are all wacked! China's revenge on the West for the devastating Opium Wars of the past.